Mjoll the Lioness is a Nord warrior and ex-adventurer residing in Riften. She is close friends with Aerin, an Imperial warrior who saved her from death outside a Dwemer ruin in which she lost her favorite sword. She retired from adventuring after this incident, instead vowing to remain in Riften and protect its people from the corruption that pervades the city. 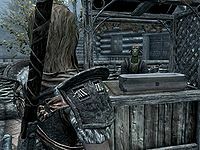 Due to this, she also vocally opposes the Thieves Guild and how they are ignored by Riften's authority, though strangely the Guild will not do anything about her. She can join you as a follower if you are able to recover her sword, "Grimsever". You must give her the sword to complete the quest, but you may take it back from her inventory freely when she is your active follower. She may also be married, as well as recruited to the Blades. Mjoll wears a set of banded iron armor, a pair of iron gauntlets, a pair of iron boots, and a leveled ring. She is equipped with a leveled battleaxe which can be up to elven quality. She carries two random leveled potions of restore health, restore magicka, and/or restore stamina. She also carries a key to Aerin's house, and a selection of upper-class loot and gold. Aerin: "Be careful, Mjoll. The Thieves Guild has Maven Black-Briar at her [sic] back. One snap of her fingers, and you could end up in Riften Jail... or worse." 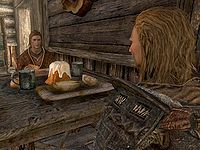 On normal days, Mjoll starts off the day at 8am with an hour of breakfast at Aerin's house. At 9am, she browses the market stalls at Riften's grand plaza for three hours until noon. After that, she heads to The Bee and Barb to consume her lunch, and relaxes there until 6pm. In the evening, she patrols the streets of Riften for eight hours. She finally heads home to sleep for six hours, and repeats her schedule the following day. When you are near her, she may say either "You're a stranger here too, eh?" or "Visitors like us are rare in this part of Skyrim." Depending on your reply to Mjoll's opinion on the Thieves Guild, she may be friendly, saying, "Well met, friend. How can I help you? ", "Welcome back! Good to see you again. ", or "Ah, you're back. What have you discovered?" or hostile: "Oh, it's you. Not here to rob me are you?" Upon exiting conversation, she may say, "Safe travels." If you have expressed your intent to join the Thieves Guild, Mjoll can be found saying, "Just stay away from me and I'll forget we had this discussion." After you offer to retrieve Mjoll's sword, she may tell you, "Please be careful, I don't wish to be the reason for your death." If you ask her about the Thieves Guild she will tell you that "To call it a guild is ridiculous. How can people who would betray one another over a gold coin be considered part of an association?" and "They're the worst kind. Even the Dark Brotherhood abides by a strict set of rules and tradition. These thieves are just rabble." "You know, I'm beginning to respect you. Other than Aerin, you seem to be the only other person I've met I might be able to trust. Since we share the same opinion of them, let me warn you that they're recruiting others to join their 'guild' and you should be cautious." "I try not to care." "That's a shame. Too many people in Riften share your view and look where its [sic] getting them. It's going to take more than just myself and Aerin to help this city... it has to want to help itself first." "Actually, I'm hoping to join them." "You disappoint me. I expected someone from outside Riften to be different, but I see corruption's reach holds little regard for boundaries. Enjoy the city. It will suit you well." Mjoll also despises the Black-Briar family, and upon asking her to tell you about the Black-Briars, she will explain, "Maven Black-Briar, the matriarch of the family, represents everything that's wrong with this city. She's bribed countless officials, has friends back in the Imperial City and freely associates with the Thieves Guild. I've tried everything I can to protect Riften's citizens from her family, but to no avail." She'll also tell you who else is in the family: "Well, there's Ingun Black-Briar, Maven's daughter. Strange girl. She likes to spend time down in Elgrim's Elixirs working on her alchemy. Then you have Hemming, Maven's son; spoiled brat and heir to her empire. He follows her word like a loyal dog follows its master. And finally, Sibbi; the worst of all of them. He's in Riften Jail for murder." Should you ask, she will confirm that she's not from Riften. "I've been adventuring across Tamriel since I was a fresh-faced young woman barely able to swing a blade. My travels have taken me from High Rock to Valenwood, Elsweyr to Morrowind and all points in between." You can further ask why she's here then, and Mjoll will elaborate on her past: "Many years ago I lost my blade, 'Grimsever,' within a Dwemer ruin. I took it as a sign that I was wasting my days in search of wealth." and end with explaining her new outlook on life: "You and I are alike. We seek challenge and great fortune. But for me, that's where the similarities end. You see, Riften is my great beast to be slain and my fortune comes from gratitude and trust." She will also describe the hardships she faces as Riften's protector: "Its [sic] been difficult. I've taken the burdens of this city's problems upon myself and I keep running into impossible obstacles. Corruption, lies and deceit are the order of the day here. If it wasn't for Aerin, the young man who saved my life, I think I'd already have given up long ago." You can ask how Aerin saved her life, to which she will reply, "It was Aerin who found me dying outside of a Dwemer ruin. If he hadn't brought me here and nursed me back to health, I would have died. When my strength returned and he told me about the problems plaguing Riften, I decided fate brought me here for a reason... so I stayed." If you ask her what happened to the blade, Grimsever, she will tell you, "It was lost years ago in a Dwemer ruin. Without it, I feel almost as defenseless as a newborn. I don't think I'll ever be able to find a replacement." You can tell her you could find the sword for her, and she will be surprised. "I couldn't ask you to undertake such a trecherous [sic] journey, it would be a fool's errand. But I see that spark in your eye and I know better than to warn you away." She will then give you the details, along with a warning: "Grimsever rests with [sic] the Dwemer ruin of Mzinchaleft. Tread carefully, friend... those same ruins almost took my life." If you instead mention that you're sorry to hear that, she will concur, "Yes, quite a shame. It was a fine weapon." Should she be asked, she'll also recount what happened to her in Mzinchaleft: "I was adventuring in the depths of the ruins when I was attacked by a massive construct... like nothing I had ever seen. When the colossus struck, Grimsever was knocked from my grasp and I was wounded badly. It was only through blind luck that I was able to crawl away from the Dwemer abomination and make my way to the surface. I must have collapsed, because the next thing I remember is Aerin standing over me tending to my wounds." Upon returning to her with the sword, you can tell her you've located Grimsever, and Mjoll will be astounded: "Astonishing. To think you actually were able to reach it and yet return to tell the tale. Rarely in my travels have I encountered those who possess skills equal to your own. I see I still have much to learn. If you'd permit me, I'd be honored to accompany you in your travels for a time." If you have told her that you are looking to join the Thieves Guild, she will instead say, "When you told me of your intent to join the Thieves Guild, I honestly didn't think we'd have much to speak about ever again. Yet here you are with my weapon that you could have easily sold or kept for yourself. Forgive me for my hasty opinion of you, I see that I was wrong and that there's much I can learn from you. If you'd permit me, I'd be honored to accompany you in your travels for a time." Either way, she will be available as a follower from now on. During the quest Spread the Love, you can give one religious missive from the Temple of Mara to Mjoll, who will appreciate your gestures: "Thank you. I'll share this with Aerin." It seems that Mjoll's deeds to the people of Riften have not gone unnoticed, as seen with her conversations below. Should you approach Jarl Laila Law-Giver for the title of thane, she will also acknowledge the Lioness, saying, "Much like Mjoll, you've become champion of our hold; helping people with their difficulties and providing assistance for their needs. As the Jarl of Riften, I feel it's my duty to honor your selfless behavior by honoring you with the title Thane of Riften." Mjoll: "Well met, Brand-Shei. I've come by to browse your wares today." Mjoll: "I was hoping you could help me. It seems I've lost a ring that also means quite a bit to me. It's made of gold with an inscription on the inside that says "sand elske."" Occasionally, Mjoll can be seen giving money to Riften's beggars, telling Snilf, "Another uncounted causality [sic] of this war. Here you are, you poor man." and telling Edda, "Yes, of course. This war is causing your woes, it's hardly your fault." "Riften has problems of its own. Now is not the time for exploration and discovery." Mjoll: "No, my friend. That would be reckless. We have to help, but help in a way that doesn't directly place anyone in harm's way. For now, give this "Ratway" a wide berth." 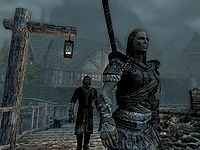 Mjoll is a talkative follower and has unique dialogue pertaining to most places you visit (including details about her past). She will often talk over other NPCs, even if they are engaged in quest-related dialogue. Recruited "I'm right behind you." You already have a follower with you "You already appear to have someone with you." Spoken to "I'm itching for a fight." Ending conversation "All set, let's go." Healed "Huh. I feel better now." Casting a Courage spell on her "I cannot be beaten!" Told to wait "Certainly. Be careful." Talked to while she is waiting "So what's the plan?" End conversation while she is waiting "I'll wait here." Told to follow "I'm ready. Let's go." During battle "The White take you!" "By Ysmir, you'll pay for that!" "Ha! Think you can take me?" "You're as good as dead!" "I'll paint the snow with your blood!" "I love a good fight!" Asked to trade items "No problem, I can carry a good bit of gear." Told what to do "Anything, as long as I get to fight." Selecting what to do "Did you need something?" Canceling a command "Anything else before you go?" Activating her while selecting a command "Do you still need me for something?" Doing selected command "No problem, I'll handle it." Told to do an impossible command "I'm sorry, that can't be done." Sleep (owned). "I'm sorry, but I'm not going to do something like that. Even for you." Anywhere "I've really missed traveling like this. Walking the breadth of Skyrim has always filled my heart with excitement." "I've never been a sellsword... never traded my skills for pay. I've always adventured on my own terms." "You should have seen me at the height of my adventuring career... I was fearless and took too many risks. But that's what it was all about." "I remember a cutpurse trying to rob me on the road once. When I drew Grimsever, I think the poor man soiled his armor!" "I've seen enough death to last three lifetimes, yet I never tire of a good fight. What do you make of that?" "When I was young, I'd journey with my father on hunting expeditions into Morrowind. The cliff racers made for excellent sport." "I love the cold air... it's exhilarating. Perhaps it's because of my Nord blood, but there's something about it that makes me feel alive." "My father wanted me to follow in his footsteps as a hunter, but I set my aspirations a bit higher. He never complained... I miss him." "My mother was a strong woman... she's the one who instructed me on my swordfighting techniques. Can you imagine?" "People say Skyrim is one of the most dangerous places in Tamriel. I think they're wrong... it's magnificent and I'm proud to call it home." Whiterun "Whiterun is a such [sic] beautiful city. Have you ever seen the likes of this place?" High Hrothgar "The Greybeards are an amazing lot. Imagine, living your entire life without speaking to a friend or a loved one. I couldn't stand it." Ivarstead "I've been to Ivarstead a few times, but never climbed High Hrothgar. I wouldn't mind visiting the monastery at the summit." Winterhold "Ah, Winterhold. I've always wanted to visit this place. The secrets locked inside must be astounding." Markarth "Incredible... imagine the manpower and ingenuity needed to carve the buildings of Markarth." Windhelm "This is the first time I've set foot in Windhelm. What a dreary place." Solitude "My mother always loved the sea. When I was young, we'd visit Solitude and watch the ships from the bluff. Ah... better times." Riften "When the weather permitted, Aerin and I would often walk the Rift's forests. The trees here are so beautiful." "It feels good to walk the streets of Riften again." Vampire Lair "Vampires... an unclean lot. It will be a pleasure to clear this place." "Don't let the vampires strike you or else you may get infected with their blood poisoning." Warlock Lair "Be aware of rune traps on the ground or else this could be a very short expedition." "Kill these casters as fast as you can, otherwise they may summon creatures we don't want to deal with." "Ugh... dark sorcery. Always makes my skin crawl." Draugr Crypt "If there's one thing I'm certain of, it's that draugr burn like tinder. We could use that to our advantage." "Many have fallen in this crypt. The Draugr show no mercy." "Ugh, Draugr. They reek of decay." Bandit Camp "When I was a child, my village was burned to the ground by bandits. Do you know I actually saw one laugh as he ran my brother through..."
"I hope there's more bandits around... their numbers could use a little more thinning." "These bandits would stab each other in the back if it meant an extra coin in their pockets." "Bandits... the worst type of scum." Military Fort "Perhaps we can find some treasure if we search the grounds of the fort thoroughly." "If [sic] fought more than my share of bandits in places like this." "Keep your eyes open for ambushes. These forts have too many blind corners." Dwarven Ruin "These are the most dangerous, but the most profitable types of ruins. The dwarves must have been a prosperous race." "Watch the walls for the sphere constructs... they can appear in the blink of an eye." "The dwarves were masters at subterranean construction... these ruins show only a fraction of their capabilities." (If in Mzinchaleft) "Mzinchaleft. I swore I'd never return here." (If not in Mzinchaleft) "I almost died in a ruin just like this." Nordic Ruin "Danger's about, I can tell. Be cautious." "Can you just imagine how ancient this place must be? Hundreds of years? Thousands?" "There could be Draugr about, I can smell the decay in the air." "I've ventured into quite a few Nord ruins in my day." Cave "Killed my first creature in a cave just like this... I'll never forget it." "I'm certain we'll find some treasure down here." "Keep your eyes open, I don't like the looks of this place." "Exploring these caves feels like coming home. I missed this." Mjoll is always essential, even after completing her quest, which means that she can never be killed. If Mjoll is recruited as a follower, she may not equip some rings that you give her, regardless of enchantments, because she has a leveled ring equipped by default. Rings that are worth more than that leveled ring might be equipped. If you marry Mjoll, she will briefly equip her wedding ring, allowing you to purchase the rest of her rings from her (see the final paragraph of Follower Equipment). Be sure to do this as soon after the wedding as possible, otherwise she may go back to wearing her default ring. If you marry Mjoll, you can take everything in Aerin's house in Riften. 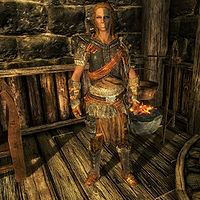 If you happen to kill Aerin, Mjoll will start to dislike you and thus cannot be recruited as a follower. Mjoll will continue to be your follower if Aerin's death is not considered a crime on your part by the game, e.g. he attacks you or the crime is not observed. She is a powerful two-handed warrior; but her favorite sword, Grimsever, is a one-handed glass sword. This issue has been addressed by version 1.2.3 of the Unofficial Skyrim Patch; it makes Grimsever a two-handed sword. Mjoll's missing ring is inscribed with "sand elske", which is an incorrect word by word translation of the English phrase "true love" to Danish. The correct Danish phrase would here have been "sand kærlighed". If you marry Mjoll and recruit her as a follower, then dismiss her, she will repeat her dismissal line ("Such a shame. I thought we were getting along so well. I'll head back to Riften if you should have second thoughts.") even though she will return to your home like any spouse. If you marry Mjoll and decide to move out of Riften, Aerin will move into your home. If Mjoll is recruited as a member of the Blades, Aerin will follow her to Sky Haven Temple. After marrying Mjoll and adopting a childHF, the option to ask how the children are doing isn't available. This bug only applies to player built homes; she'll comment on houses purchased in cities.